In a press address as cited from The Post Newspaper, Thursday 1st April 2010, Lusaka Stock Exchange (LuSE) General Manager, Mrs. Beatrice Nkanza said small and medium scale enterprises (SME’s) had corporate governance issues that needed to be addressed before they are considered for listing on the stock exchange. This was in light of the second tier that is being created for the sub-sector. She said the Securities Act (Cap 354) had been reviewed to embrace SME’s on the stock market and that all that was remaining was for parliament to enact it into law. Once this is done, SME’s will play the Market. She however highlighted the fact that corporate governance was a big challenge to the sector and that SME’s needed to ‘put things in place’ by having structures, clear separation of roles and generally conform to good governance practices. So what exactly is Corporate Governance? There are several definitions for corporate governance. However, the most appropriate definition which is more relevant to SMEs describes corporate governance as "a set of rules, regulations and structures which aim to achieve optimum performance by implementing appropriate effective methods in order to achieve the corporate objectives". In other words, corporate governance refers to internal disciplines or systems which govern the relationships among 'key players' or entities that are instrumental in the performance of the organization. Moreover, it supports the organization's sustainability on the long term and establishes responsibility and accountability. What does it help achieve? The guidelines of corporate governance aim to achieve greater transparency, fairness and hold executive management of the organization accountable to shareholders. In doing so, corporate governance plays a pivotal role in protecting shareholders and, in the meantime, duly consider the interest of the organization at large without prejudice to employees' rights. Whilst executive management should have reasonable level of power to run the business, corporate governance ensures that such powers are set to practical dimensions in order to minimize misuse of authority to serve objectives not necessarily in the best interest of the shareholders. Therefore, it provides a framework for maximizing profits, promoting investment opportunities and eventually creating more jobs. For that reason the principles of corporate governance apply on those who assume the ultimate responsibility for success or failure of the organization. On the other hand, it is imperative to understand that the proper implementation of good corporate governance does not necessarily guarantee success of the organization. Meanwhile, a bad corporate governance practice is certainly a common syndrome causing failure in many organizations. What is the current national scenario on SMEs and Corporate Governance in Zambia? The misconception about SME's that stems its roots from the size and the perceived contribution of this segment to the economy is slowly changing. The reality is today SMEs may appear small in size but likely many of them have potentials to grow and become big entities in future. Sadly, this prophecy still not well realized and as a result, implementation of good corporate governance practices continues to be ignored even by the SMEs themselves. 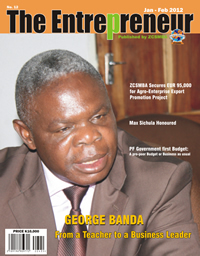 SMEs in Zambia form large segment (over 90%) of business activities in the country. Generally, they take the form of private companies owned by sole proprietors or a small number of shareholders. Often have less than 30 employees. Such companies are usually family-owned run by family members where the authorities and powers are generally held by an individual normally the major shareholder. For that reason the owners commonly consider themselves as running their personal properties and do not want to involve ‘outsiders’ in the name of the Board. The above provokes a question that particularly raises most debate in the corporate governance of SMEs - Should small companies have a board at all? The presence of an effective board can accelerate the development and growth of a company, irrespective of size. Unfortunately, many entrepreneurs are so worried about putting outsiders on the board. They think that by doing so they will give up some measure of control. So they either decide not to have a board at all or fill the board with long time friends or family members – wife, son, uncle, and so on. This is not advisable. Another question that perhaps strikes the mind of business owners and proprietors of small and medium size companies as well as the executive management team is “why should we opt to choose to introduce new systems and internal rules which impose limits on the way we do business and our business conduct?". The answer is simply corporate governance plays a significant role for SMEs since it defines the role of shareholders as owners on the one hand, and as business managers on the other hand. This is best done through a process that spells out governance rules and guidelines. These aim to assist all parties to understand how to manage the organization. As a result, internal conflicts would be better managed and more attention given to achieve growth objectives and support profitability. 1. The good governance practices pave the way to companies to grow or attract additional investors as alternative to raising capital through borrowing from banks at high cost. Additionally, companies may consider going public through the initial public offering IPO. 2. Sound governance practices lead to improved internal control systems which results in more accountability and higher profitability. The latter is attributed to enhanced controls which minimize the likelihood for fraud losses. 3. Corporate governance framework ensures that shareholders are freed from executive and administrative duties. As a result, conflicts among business owners who assume management roles in the organization would be reduced to a greater extent particularly in organizations owned by a few number of shareholders where the distinction between ownership and management capacity is blurred. Raising capital has been for a long time seen as the major challenge facing SMEs. Mrs. Nkanza during her address also stated that the biggest challenge SME’s had was keeping financial records. So it is safe to say the real challenge is absence of good corporate governance practices which consequently, makes it difficult to access finance from banks or investors. Adoption of corporate governance framework is not common not only in Zambia, but also in most developing countries. This is mainly due to lack of awareness about what corporate governance is about and its relationship with corporate performance and objectives. Besides, the widespread fallacy that implementing corporate governance entails high costs coupled with doubts that such costs would not generate the envisaged benefits to the organization. If we consider the main reasons why SMEs fail, we may conclude that implementing corporate governance contributes to a far extent to support chances for these companies to perform well, grow and adopt better process for decision making. For family owned businesses, corporate governance improves management efficiency, limits internal conflicts and helps in making transition of ownership to heirs a smooth process. Practically speaking, we need to realize that SMEs may face several problems in implementing corporate governance framework which may often seem a costly exercise. Consequently, it is essential that consideration should be given to reduce the relevant requirements for compliance and disclosure and introduce less expensive financial and administrative alternatives which such companies can afford. 2. Stakeholder relationships (Role of Advisory Board and relationship with other entities such as stakeholders, management, employees etc. Copies of the Corporate Governance Code for SME’s in Zambia are available at the Institute of Directors secretariat. This is a must have for all SME’s that want to, amongst other growth opportunities to improve on their governance so as to be eligible for listing with LuSE and raise long term finance once the second tier is operational.